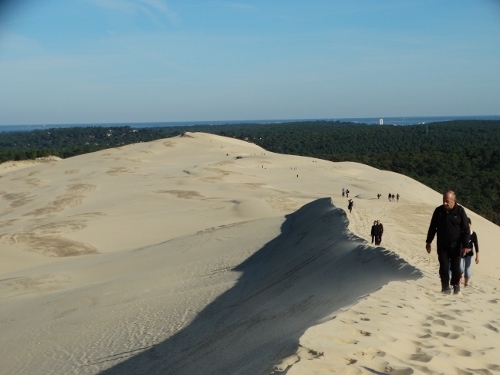 If you want to see and climb Europe’s highest sand dune, then you must go to Arcachon in France. 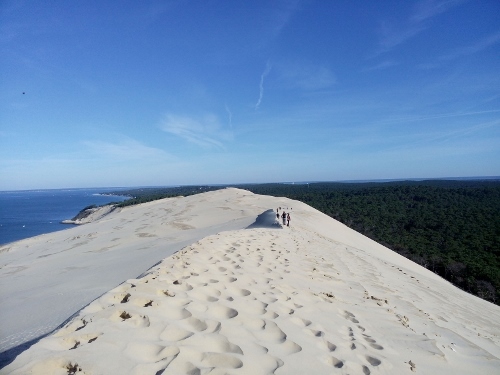 Here, you come face to face with the majestic sand dune : The Dune du Pilat (Dunes of Pilat). 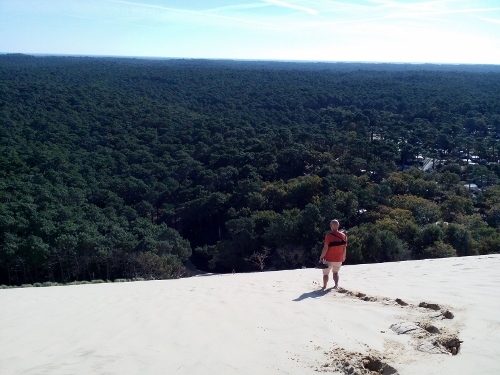 Situated in the town of La Teste de-Buch at Arcachon Bay, and with a height of 110 meters above sea level, the Dune du Pilat, also known as Grande Dune du Pilat, is considered the tallest sand dunes in Europe. Measuring about 500 meters wide (E-W) and 2.7 kilometer in length (N-S), this dune is one of the famous tourist attractions in the area. Dune du Pilat is about 60 kilometers under Bordeaux, France. With a car, take the highway A63, continue to A660 Bassin dÁrcachon-Bioscarrosse, then exit to D259 and follow the direction Dune du Pyla. Click here for more information. After staying one relaxed week in La Rochelle, France, Hans and I continued our trip to the south. So after having an extended conversation with our Dutch neighbors, we drove on in the direction of Arcachon. 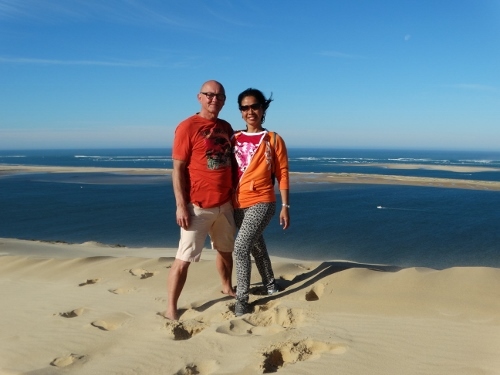 We wanted to see the famous Dune du Pilat, Europe’s highest sand dunes. It doesn’t lie exactly in our route, but since we wanted to see it once again (the last time was about 10 years ago), we thought a little detour would be okay. It was already dark when we got to Arcachon. 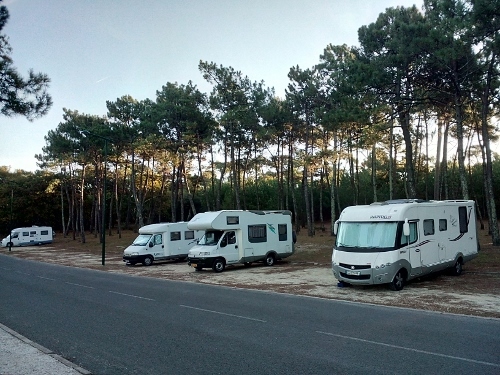 We found an overnight parking along the Avenue du Park, which is just about 100 meters from the long sandy beach of Arcachon. We stayed there together with three other RVs. The next morning, to prepare myself for a tedious hike to the dune, I did a short warming up on the beach. After that, at about 10.00, we drove about 3 kilometers to the dunes. There is a designated parking area where RVs have to pay 8 euros for 4 hours parking. To save some cents, we did not park there. We drove about 1 kilometer further, until we found a small parking area just beside Camping La Foret. From there, our adventure to the dune began. As I have stated earlier, this is our second time to be here. The first time that we climbed the dune, we were totally unprepared. We did not know what we were up to: we just followed the people going up to the dunes. Now, we know better, and hope that the climb would be a lot easier. It was fine Saturday morning. The weather was good, the sky was blue, with some scatterred thin clouds hanging underneath. It was the best day to hike the dunes. Leaving D’Traveller, we followed a sandy path going into the pine forest. We walked between high pine trees and long ferns with dry brown leaves. 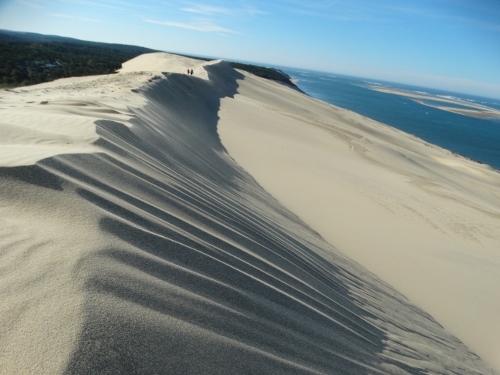 Until we caught sight of the majestic King of Sands…the Dune du Pilat. 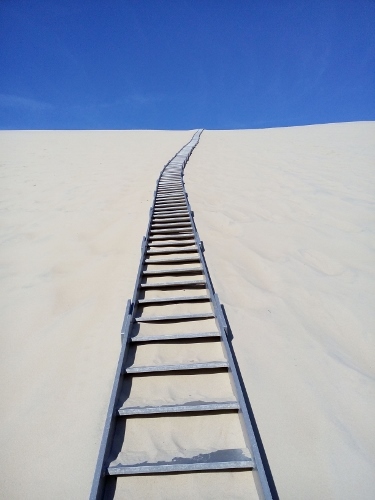 We know from our experience, that to climb this monster via the sands would be like self-murder as every step we would make would be so heavy that it would cause a lot of our energy and give us breathing problems. So when we have advanced about 10 meters in height, we turned left going to a small path to the camping. Located in the camping grounds are several metal stairs attached together which have a total of 362 steps (yes, I counted them on my way up). We used these steps, stopping once in a while to admire the views, take pictures, and rest. After the last step, there was at least about 30 meters more of sand to climb, but that was already bearable. Reaching the top of the dune, we were rewarded with a magnificent view of the Bay of Arcachon and the Atlantic ocean. The water had a bright color of aquamarine, interrupted by spots of white waves and sailboats. It was amazing! The view was simply phenomenal! From where we were standing, we had a grand view of the long coastline, the long stretch of the sand dune, and the dense Landes forest, which was thicly covered with high pine trees. A soft breeze was on the air, bringing with it sand particles that we had to be careful that nothing got in our eyes. And the sand has this gray to almost white color which have a nice firm texture that feel so good in the hand. At this time, there were already many tourists walking like ants on top of the dune. Some came from the official parking from the dune, while others from the way where we came from. It was fun taking pictures, but I had to be careful that there would be no sands coming in my camera. Situated below the dune facing the ocean is a long stretch of sandy beach. We did not come down to the beach anymore, as we were thinking that we have to get up again, this time without stairs. So we just stayed the whole time on top, enjoying the view and absorbing the beauty of nature before us. After a little more than half an hour, we decided to go down. It was a lot easier and funnier, just letting ourselves slide down to the sands. Our feet got buried in the sand in the process, with a result that our shoes were also full of sands. On the way down, we came across some hikers which we advised to take the stairs instead. It took us just less than 10 minutes to reach the bottom of the dune. Easy! 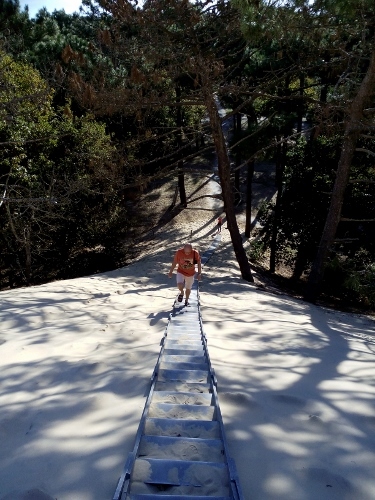 Our short detour to Dune du Pilat has again given us one of the memorable moments during our big journey to the South. Even though it has caused us extra kilometres to drive here, we did not mind, as we became witnesses to one of nature’s most phenomenal wonders!